"The Best Mix Of Hard-Hitting REAL News & Cutting-Edge Alternative News On The Web"
“You’re driving an 18 wheeler, loaded with dynamite, as you crest a hill running 70 mph you’re confronted with a school bus sideways in the road on a mountain pass. Tall mountains on the left, 1,000 ft. drop-off on the right, school kids all over the road, you’re within 50 yards and your brakes just failed. What’re gonna do? For those who are old enough to remember, that story is reminiscent of the song “Big Joe and Phantom 309,” performed by Red Sovine back in the 60s. Seems “Big Joe” was confronted with a similar situation. Like Big Joe, we have a choice. We can see the kids on the road up front and it’s our choice, do we turn the wheel, perhaps giving our own lives but helping to save our nation, or do we plow blindly ahead? In other words is our life more precious than those of our kids? Something to think about. For those of us who peruse the news on a daily basis, we have become somewhat inoculated against bad news. Our new name is LeRoy. We are accustomed to stories about a pending war either with North Korea or Russia, even China or perhaps all three of them but we just yawn and turn over, we’re napping in the sleeper. If war does come to pass you can bet a dozen more countries will jump into the fray attempting to earn points with the ones they think will win. They’ll be making a huge mistake. We have seen endless cycles of war and peace as we read history but we have never before been at a point where literally hundreds of millions can be wiped out in a matter of a few minutes or a few hours. 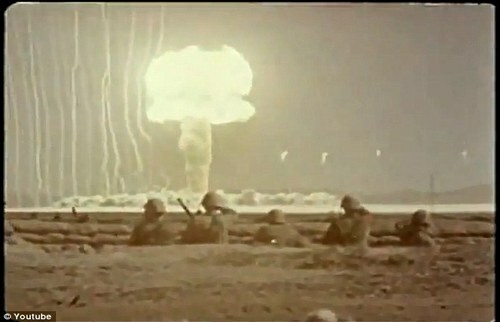 When we came out of the trenches following the atomic bomb test, we saw a “ring of fire” 16 miles in diameter. The blast had taken out EVERYTHING for eight miles in every direction from the point of detonation and the subsequent sucking back in to fill the void, created a smoking and blackened desert. Nothing survived except those of us who were protected in 6-foot deep trenches. Now apply that to a city the size of St. Louis with zero below ground protection. You can expect nothing but blackened ground not for 16 miles but more likely 50 or more. The Phoenix metropolitan area stretches about 100 miles across. What will the world be like if the entire area is reduced and reverted back to horny toad and lizard pasture in less than 1 minute? According to Ploughshares.org, Russia possesses an estimated 7,000 nuclear weapons. The United States is close behind with about 6,800. The rest of the “civilized” world has about 1300, all told more than 15,000 weapons that would make my little atom bomb, “little.” Suffice it to say we are hanging by the proverbial thread and one crazy man in Asia or D.C. can light the match that burns the last link to a world that exists only by the Grace of God who controls it all. 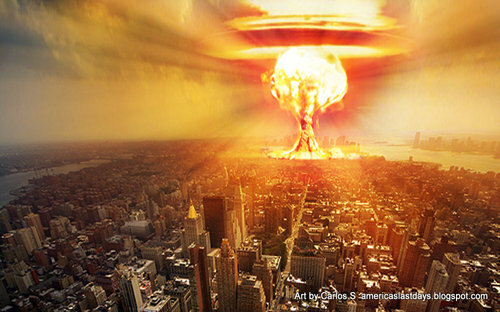 So the question becomes, “Will we be destroyed in a nuclear conflagration? Some have pointed to oft quoted Deagle.com and their projected population reductions “as a forecast of nuclear war:” Apparently that’s not a correct assessment. Deagle is predicting the American population will be reduced to about 54 million, down from 323 million at present (July 2017) by 2025. Because Deagle says it gleans its data from “official sources” and because they realize all people either are, or have been liars, they do publish a qualifier, and it turns out they’re not even considering nuclear war as a factor. Before you jump up and exclaim, “THAT’S GOOD NEWS, NO NUCLEAR WAR!” Just consider for a moment; if conditions are so bad here that the Muslims and Mexicans and others want to go back home, how bad will it be? If you’re still living in dreamland and thinking your kids are going to be taking cruises to Alaska and most Americans will continue to enjoy the cream off the top of the world’s economy, better think again. The globalist maniacs who want to control the world are fast taking us into the world of “1984” or “Brave New World.” If you haven’t read these “prophetic” books we suggest you get busy and do read them so you’ll be mentally prepared for dark days ahead. Then read your Bible to find the antidote for impending chaos. “Over the past two thousand years we have witnessed the Western civilization built around the Mediterranean Sea shifting to Northern Europe and then by the mid 20th century shifting to an Atlantic axis to finally get centered into the States in the past 30 years. The next move will see the civilization being centered in Asia with Russia and China on top. Historically a change in the economic paradigm has resulted in a death toll that is rarely highlighted by mainstream historians. When the transition from rural areas to large cities happened in Europe many people unable to accept the new paradigm killed themselves. They killed themselves by a psychological factor. This is not mainstream but it is true. A new crisis joins old, well known patterns with new ones. Since the report quoted, our future has become even more precarious with a stock market bubble that reaches far beyond Wall Street. Almost every economy on earth is in the grip of a central bank that is bleeding the world. When this thing goes down (the law of gravity will take care of that), the resulting chaos will probably be the final piece of the puzzle that ushers in the seven-year period biblically known as Daniel’s Seventieth Week. We’ve been sold out by insane politicians and academics on both sides of the Atlantic and Pacific. The seeds were planted long ago and are just now bearing fruit. 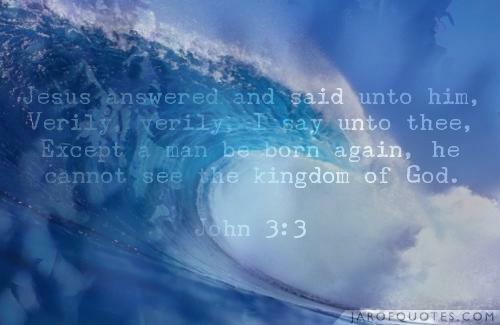 Joh 3:3 Jesus answered and said unto him, Verily, verily, I say unto thee, Except a man be born again, he cannot see the kingdom of God. The views expressed by story contributors to All News Pipeline are their own and do not always align completely with those of ANP. * Men Of Fighting Age Make Up Majority Of Illegal Immigrants Attempting To Get Into America But MSM False Talking Points Say Otherwise - More Proof America Is Being Set Up For A Fall?